Google says it will treat its shopping service the same as rivals to prevent further European Commission fines. And it said it would split Google Shopping from the main Google business. The shift comes after Google was hit by a record antitrust fine of 2.4bn euros ($2.7bn; £2.2bn) in June for unfairly favouring its own service over those of its rivals. The company said Google Shopping and its competitors would now bid on equal terms for ads in the shopping box. The Commission had accused Google, part of the California-based Alphabet group, of giving its own shopping service unfair advantages over the competition. It spent seven years investigating complaints made by other price-comparison services that claimed they had lost 90% of their traffic to Google Shopping. 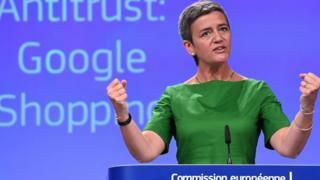 In June, as well as the 2.4bn euros fine the European Commissioner for Competition, Margrethe Vestager demanded Google change its policy or face a penalty of up to 5% of its average daily worldwide turnover. As well as changing its shopping service business, Google has also lodged an appeal against the original fine. Google spokesman Al Verney said: "Google Shopping will compete on equal terms and will operate as if it were a separate business, participating in the auction in the same way as everyone else," he said. Google controls roughly 90% of the search market in Europe, according to EU data. Lobby group FairSearch, which represents many of Google Shopping's rivals, said it would keep a close eye on developments. Its lawyer Thomas Vinje said. "We will be watching closely to see if this remedy ends the abuse so that consumers get the best prices and most relevant results, and competitors have an opportunity to innovate,"